Our 2017 Gathering of Leaders has finally begun! We kickstarted this year's Gathering with a formal opening by Shawn Bohen of Year Up, Tulaine Montgomery of New Profit, and Charlie Rose of City Year. Stay up to date on all of our discussions via our live stream. We are thrilled to have an inspiring panel, featuring Kim Syman of New Profit, Ambassador Andrew Young, Courtney Cogburn of Columbia University, Joia Pardo Matthews of Harmless Harvest, Ali Noorani of the National Immigration Forum, Sarah Di Troia of Sarah Di Troia Consulting, and Shruti Sehra of New Profit. We hit the ground running with Kim Syman, the organizer of the Gathering of Leaders. “These are my favorite days of the year, and every year they’re better," she said, introducing herself to the room of leaders. Her discussion highlighted the evolution of the event, and the three main ideas it’s focused on: proximity, systems and action. The panelists kickstarted a discussion of how to operate in a nonpartisan way, expressing our views, while respecting the views of others. “What’s it really going to take to build coalitions that are authentic?” Tulaine asked the room, acknowledging that the only way to make change, and move forward, is to collaborate. Following the themes of inclusion, diversity and equity, the panel introduced a video segment from Ambassador Andrew Young. “It’s a very good time for us, and a very good time for you, to shed some light on the enormously complex global environment we’re facing today,” he exclaimed. He went on to acknowledge the various opportunities that adversity presents, and that it is our duty, as agents for social change, to take that head on. Up next was Courtney Cogburn of Columbia University. “If you can create these very real experiences in virtual reality, you can put someone in another pair of shoes,” Courtney said of her project that utilizes the technology of VR to explore the experiences of racism. To better acknowledge the disconnect between various conceptualizations of race, we need to do our best to experience life outside of our own understandings and perspectives. Following Courtney was Joia Pardo Matthews of Harmless Harvest to share her story on race and the power of proximity in practice. Growing up in an immigrant neighborhood, Joia noted that she hadn’t truly acknowledge race until she went to college and was faced with adversity. However, this isolation and distance that she experienced motivated her to find ways to come together. 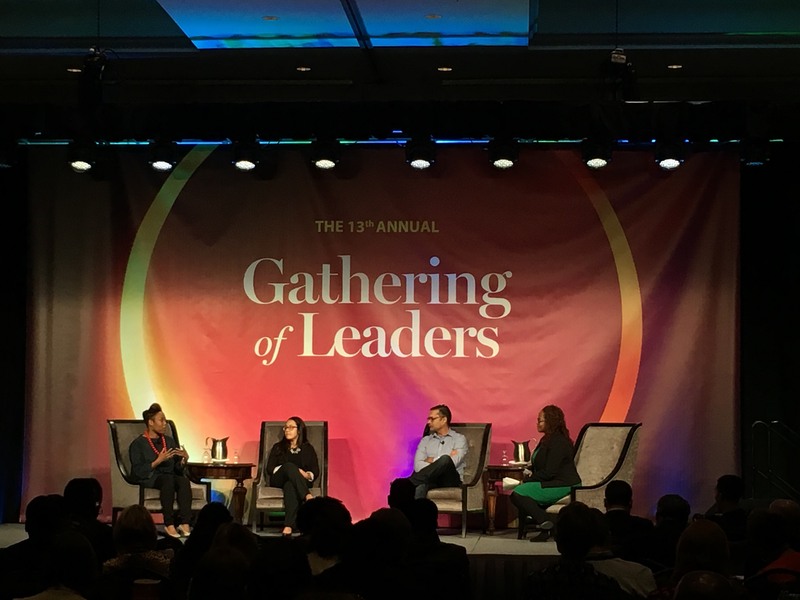 Reflecting on these experiences, and learning how to raise two biracial children in our current political climate, Joia noted that the Gathering is her chance to plug in, and find answers outside of her bubble. Ali Noorani of the National Immigration Forum, echoed Joia and Courtney’s sentiments and told a story of a close friend who voted for President Trump, and the surprising hope that brought for him moving forward in his work on immigration. “At this moment in time, I am hopeful for the future because I know there are a lot of people who voted for President Trump, and believe in the Golden Rule. It’s a challenge, but I’m excited for that challenge,” he concluded. Sarah Di Troia of Sarah Di Troia Consulting followed this panel, continuing the discussion of proximity and introducing the new Small Group Experience exercises. “Change happens through relationships,” she added, emphasizing a focus on openness, transparency, authenticity, intimacy and intensity. "Listening across differences: slow down, get curious, make your assumptions transparent." Before breaking off into groups of three for the Small Group Experience, Shruti Sehra of New Profit led the room of over 300 leaders in a group mindfulness meditation. “Pause, reflect, relax,” she concluded, wrapping up the 2017 Gathering of Leaders Formal Opening and Welcome.